A Cattail is regarded as one of the Fantastic 4. One of 4 plants that could save your life. Know what the other three are? Here are the parts of the Cattail that we are going to be talking about starting with the roots and rhizomes. Rhizomes are underground stems. They turn into the shoots, stalks, seed heads with Male and Female parts and are all edible. There can be little corms at the base of the rhizome which are just young shoots. These are particularly tasty and can be eaten raw or cooked after the outer peel is removed. From the rhizomes you get flour, starch, and sugar syrup. Edible anytime of the year, needs to be cooked or roasted and tough outer layer removed to get to the soft, inner core. A simple way to eat cattail rhizome in the field is to bury it for about five minutes in a bed of hot coals and then chew the sticky starch out of the outer rhizome and the strings that run through the center. Next, the young stalks can be eaten raw or cooked after the outer leaf blades are peeled off like a leek. Here is where the rule of thumb saying came from. To get to the soft inner core you push on the stalk with your thumb and it separates the core from the stalk. Very nutritious. Taste like asparagus. Tends to be a little dry when cooked. Butter or olive oil will fix that right up. 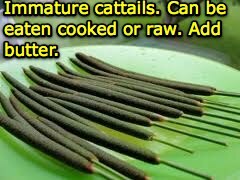 The shoots provide beta carotene, niacin, riboflavin, thiamine, potassium, phosphorus, and vitamin C.
Everybody knows what a cattail looks like. There is hardly a marsh, wetlands, or body of water, brackish or fresh, that does not play host to this hotdog-on-a-stick-looking plant. then I am going to tell you things about this plant you never knew and it may just blow your mind. 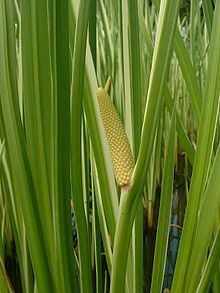 Cattails, Typha latifolia, is a grass from the Gramineae family chiefly herbaceous but some woody plants including bamboo; reeds, tules, bulrushes, sugar cane and cereals like wheat, oat, barley, rice, & rye. 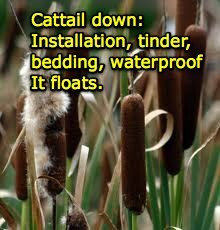 Difference here is that every part of the cattail, not just the seeds heads, is usable. Plant boasts eight food products, three medicinals, and at least 12 other functional uses. One is an Iris which is poison and the other is the Calamus which is not. Let’s talk Iris first. Spring is the only time of year when there can be some confusion and for a very short period. Everything is green in spring and about the same size starting out. Iris and members of the Iris family only reach about 2 feet in height. 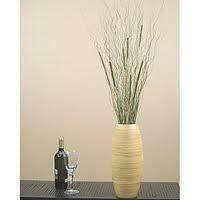 Cattail’s get up to 8 feet and will tower over the Iris in very short order. Just to be safe know your look-a-likes. Blue Flag (Iris versicolor) and Yellow Flag (Iris pseudoacorus) and other members of the iris family all possess the cattail-like leaves. All members of the Iris family are poisonous. Upon close inspection however, there is a very obvious difference. 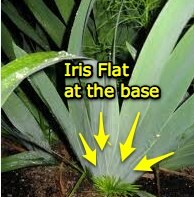 If you follow the leaves which are flat and smooth with no ribbing to the flat fan arrangement at the base of the plant you have an iris. Cattails leaves have a midrib which form around a stalk and they do not fan out. Iris’ are not edible but the roots are used as a fixative in dyeing materials. The other look-alike which is not poisonous, but whose leaves look more like cattail than iris is the Sweet Flag or Calamus. (Acorus calumus). The leaves on a Sweet Flag are wavy and have parallel venation with a midrib. It has a seed pod growing out of the side of the stock. Cattail seed pods are ALWAYS at the top of the stem. Sometimes the margins on the Sweet Flag are red. Cattail leaf margins are never red or wavy. The legendary Japanese sword Kusanagi got its name from the Calamus. In some east Indian and Chinese cultures the roots of the Sweet Flag have many medicinal uses. Our American Indians used it quite extensively. So, if you find a Calamus make a note you may want to go back later. If you are in doubt if the plant is a Cattail or a Calamus just bruise the leaf. If it has the sweet, spicy aroma it is a Sweet Flag. Cattails, if anything, smells like grass. So, now you have a positive Cattail ID. It’s Spring. Now what? 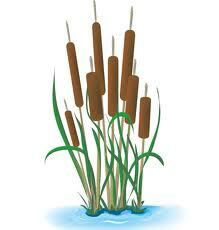 Make sure the water where the Cattails are growing is safe. No runoff, factories around, dumping, or contaminants in the water. 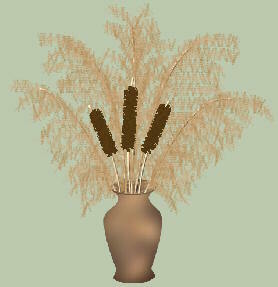 Cattails are a super filtering systems. They will take up the pollutants, heavy metals, chemicals, and clean up the water. However, all those chemicals and pollutants are now concentrated in the plant. If you eat from a plant in a polluted area you will be getting all the contaminates that plant took out of the water. 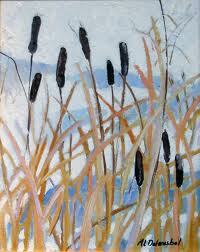 So make sure your Cattails have a good clean water source. Cut the top tough part off. That is just immature leaf formation and the leaves are actually the only part you don’t eat. Leaves are used to make mats, shoes, hats, baskets very sturdy stuff if you know how to do it. And if you burn the leaves and make an ash and apply it to cuts it will stop the bleeding. There is a mucilaginous gel between the leaf layers. Save this gel if you can. It is used as a thickener in soups or spread it all over your body. It is an antiseptic. A little later in the season but before the summer solstice the stalks will start to bulge out in spots. This is the seed head forming in the stalk. It’s edible. Peel the covering away. The green flower heads can be steamed and eaten like corn-on-the-cob. Dip in butter. There is a core just like corn don’t eat that. By mid-summer the yellow pollen will be falling from the spike atop the flower heads, and can be shaken into a paper bag to use in thickening soups or even mixed with flour for making bread or cattail pancakes. The “fluff” of the mature flower heads was once used to stuff life jackets, and is still perfect as an emergency insulation. If you are lost and without sufficient clothing, you can fill your jacket with it. Use it to make a warm mattress as well with very tight weaved material so the fluff does not escape. Stuff it in your shoes to keep your feet warm. Keep the fluff contained. Cattail flower head fluff is also very flammable. Break open a mature flower head (available almost any time of the year) and make a pile of it. Then strike a match to it, or even a good spark, and it will burst into flame. The tight heads are often dry inside even after a heavy rain, making this a great survival tinder. There you have it. The Cats out of the bag now. A real lifesaver in more ways than one. My Hero. Learning is always good. Thank you. I run a website called Knowledge Weighs Nothing (http://www.knowledgeweighsnothing.com). We collect the best advice, tutorials and reviews on homesteading, prepping and survivalism. Other than to inform our visitors, the website’s main goal is to generate income from advertising. We are however non-profit, we donate all profit to the Red Cross to help victims of disasters. I just thought it would be nice to connect and let you know I have shared your article. Any problems or comments, let me know. Thanks for the shout out Rich. This is what it is all about, getting info out there. So delighted you found it useful and want to share. Thanks for asking. Checked out Knowledge Weighs Nothing, love the name, and I feel right at home and in very good company. How to open a padlock with a coke can. Now that is useful info. Can return in kind here. Do check out http://www.knowledgeweighsnothing.com/ folks. It is a lot of fun. If you liked Cat’s Meow you might also like Sprouting off. Just Makes Good Cents. "Got Gold? Grow it. Wheatgrass. Unbelievable. So, thanks again Rich will be in touch. Wow, getting pretty slick with the Skitch, ma! This is a great article. Packed with lots of useful info! Thanks for posting this. There is enough cattail in Africa’s Lake Chad basin to overfeed their famines. Uncontrolled, it is an enormous problem – the main driving force in local desertification. It is also the best feedstock for ethanol production. I’m out to save the world FROM and WITH cattails. Thanks for helping with the WITH part. You are very welcome Stephen and thank you for your interest and dedication to bringing out the best in this little jewel. With a plant that has so much to offer in the form of sustainable and renewable resources it is hard to believe you would have any resistance. I once tried to herald the many uses and functions of Bamboo and was confronted with a vested interest that proved to be too well established for me. All I was able to do was plant some seeds of thought and wait for them to take root. I do understand what you are up against and I am hoping you are able to have more of an impact with your well intentioned project. As an ethanol product I am sure you are familiar with ethanol guru David Blume whose book Alcohol is a Gas is the bible on the subject. The man can get blood out of turnip. All the best Stephen and thanks for the comment.